3rd generation of the Elliptic Anemometer offering the advantages of elliptical cups. Redesigned for tough environments with an all-metal body, dual arm cups and oversize ball bearings, it brings a new level of reliability and dirt resistance to operations in tough environments like winter road weather stations and coastal environements. 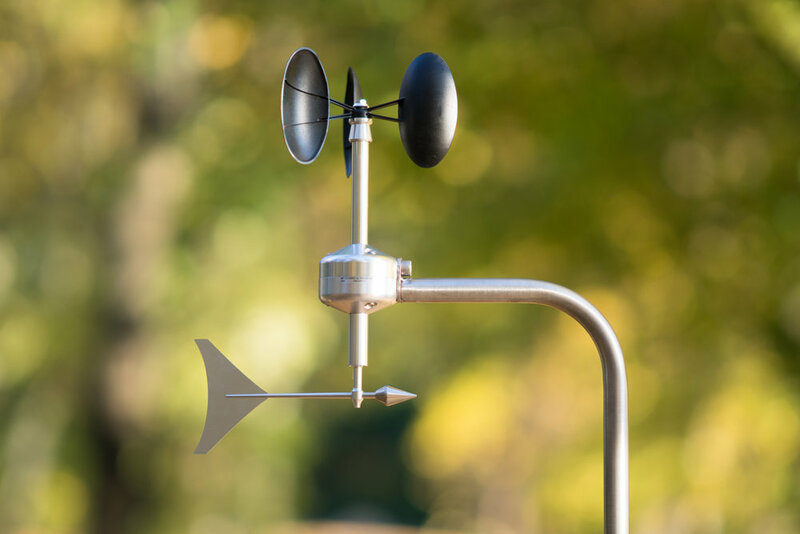 Has been replaced by MeteoWind 2 and MeteoWind Compact anemometers. Very low start speeds, fast response and accurate long-term wind data are their inherent benefits of elliptic cups including resistance to snow accumulation in winter cold winter climates. Combined with an all metal wind vane, it offers a superb value compared to separate anemometer & wind vane installations. Years of use in road weather stations in Central Europe and the Alps have verified this sensor's reliability. Tough roadside weather station conditions expose the sensors to corrosive wet and salty environment with large amounts of dirt, dust and water spray. Each MeteoWind is individually tested. We rely on strict quality ISO-9001 guidelines to maintain high production quality and sensor reliability. The dusty environment in agriculture exposes weather sensors to a variety of year round conditions. Bearing protection from dust and dirt is essential since anemometers get exposed to significant amounts of dirt and dust during planting and harvest, when meteorological data is most important. Industrial level lightning resistance is guaranteed by the triple-level lightning, EMI, ESD, Surge and transient protection, ensuring reliable operation in all-weather conditions. Constructed from anodized aluminum for corrosion resistance with stainless steel ball bearings. The fiber reinforced plastic (FRP) anemometer cups with their patented elliptical shape offer very good strength and all-weather accuracy and significantly reduce snow buildup in winter weather compared to conical and circular cup anemometers. Single point mounting system of MeteoWind 1 with an IP67 connector bayonet connector protected inside the Ø20mm stainless steel tube mount offers superb electrical reliability and allows for quick and easy installations to same technical crews time. Additionally, MeteoWind anemometers also feature serviceable rotor cups & main bearing. Measuring wind speed and wind direction by a single instrument versus two separate instruments mounted meters apart increases data quality and reduces uncertainty to manageable levels. Higher data quality in turn reduces data analysis time and paints a clearer picture of weather condtions. Patented elliptical design offers a larger wind blown area than circular and conical cups for higher aerodynamic torque to overcome bearing friction. Result is more consistent anemometer response throughout the complete air temperature range. Efficient all metal design with superb response rate and good aerodynamic damping to prevent overshoots and reduce wind data noise. Held in place by two oversize stainless steel ball bearings for robustness and dirt resistance. Highest class 3-stage lightning protection against over-voltage, over-current, high speed voltage & current transients and surges gives MeteoWind 1 electrical reliability well in excess of analog output anemometers. RS-485 MODBUS interface adds compatibility with industrial and SCADA systems. The use of 3-stage lightning protection is complemented by the use of RS-485 digital output which has inherently high resistance to interference and is therefore most widely used communication interface in tough industrial environments. MeteoWind 1 offers reduced cost of ownership and higher reliability compared to separate wind vane & anemometer installations which translates into long-term economic benefits for industrial and weather station operators.